For new visitors, HIF cover meets all 457 visa requirements easily, and just like Frank–this is extremely affordable as well. Regardless of whether you’re single, a couple, or a family, the Department for Immigration and Border Patrol dictates that “it is compulsory for a 457 visa applicant to make plans for visitors health insurance for themselves and accompanying family members.” This insurance cover, once purchased must be maintained throughout the duration of a stay. Yes, all of the top 5 covers do meet DIBP requirements and are some of the most popular visitors coverage today. The chart below illustrates some of the various differences in pricing and benefits, which is another great starting point for new visitors. Visitors will find Australian Unity listed on this small diagram as one of the five more popular choices among visitors. Again, it also offers some extra cover options, lower costs and prime benefits. It also offers a “workers cover plus” choice that many visitors find more than flexible. In fact, Australian Unity fund, when compared to those like iman, Frank and HIF provides a little more flexibility than others mentioned. Why Choose Australian Unity For Your Visitors Health Insurance Coverage? Not only does Australian Unity offer one of the lowest prices for visitors health insurance, again, it offers so much more flexibility. With regard to flexibility, what happens in this policy is that overseas visitors have the choice to actually mix and match their hospital and extras cover features. The reason the prices are so much more reasonable is because, this is a members own health fund. This simply means that there doesn’t need to be any profits made and given to shareholders, which clearly saves a great deal of money, passable to the members! 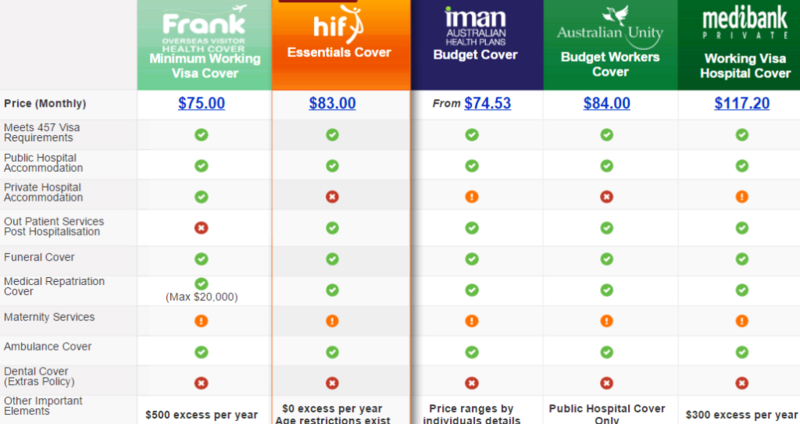 When comparing Frank’s visitor health insurance to Australian Unity, visitors will find that private and public hospital treatment is covered, it meets all DIBP requirements, and waiting periods are very minimal. Let’s take a look at Frank’s and see how features vary from competitors. Yes, Frank is one of the more reliable visitor health insurance coverage plans that promises 457 visa health insurance compliancy without question. It is also a subsidiary of GMHBA, which meets the needs of many 457 visa holders. This is a “not-for-profit” option, making it preferable among competitors. The reason visitors can do very well with Franks cover plan is due to its affordability, flexibility, multiple features, short wait periods, incentives and more. Frank passes on savings to members, much like Australian Unity does. The below illustrated chart goes through some of the similarities and differences in services and costs for visitors. This will help visitors who are singles, couples, or families. You might find this to be the more viable health fund cover plan, and the most practical. 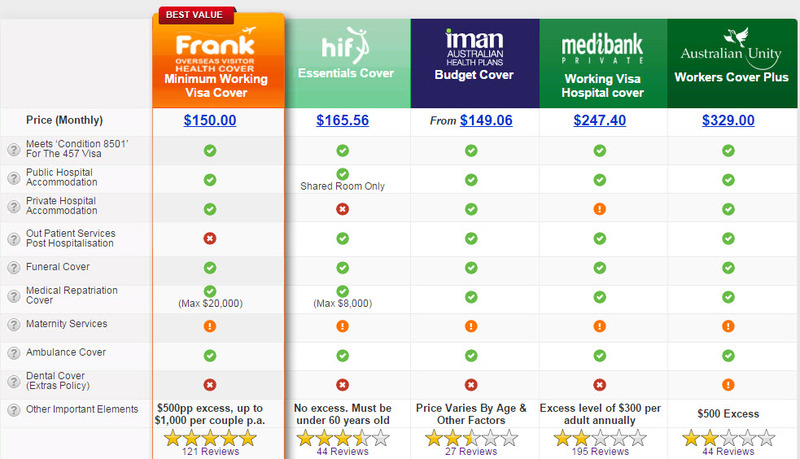 Who Is Best Suited For Frank Overseas Visitors Health Insurance? For those visiting Australia who have no issue with receiving medical care in a public hospital environment–and who want to avoid excess fees, Frank and others like HIF might be the best options for you. All of the aforementioned visitors health insurance funds are exceptional and it is definitely up to the visitors to choose what will work best for them. Again, all do meet the DIBP requirements and offer above standard care while visiting Australia.